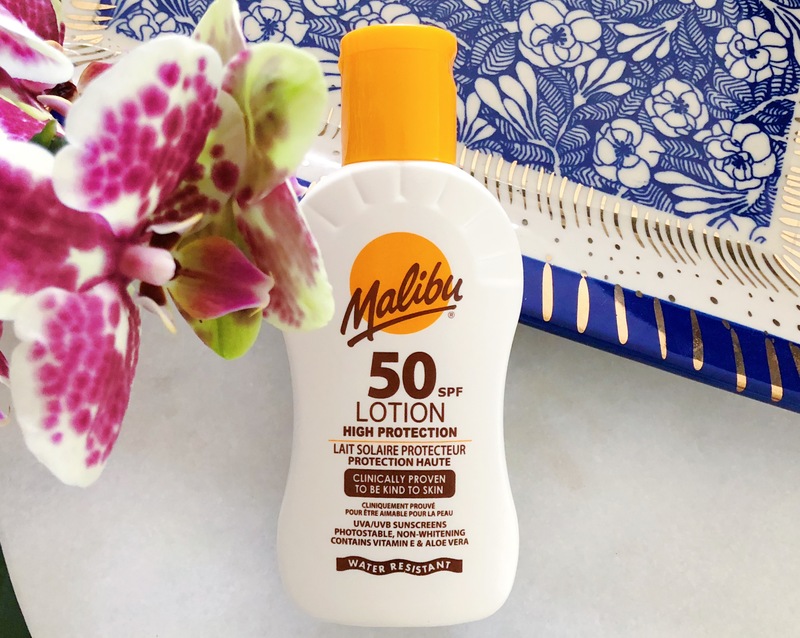 When word on the street hit MUA that CVS was having another one of those 75% clearance sales, I drove to my closest CVS hoping for a few good finds. I didn't want to come home with a buttload of stuff, but figured I could grab a few polishes or HiP pigments if any of them were on sale. Once inside, I combed over the the entire beauty section three times, searching for the magical green sticker that would indicate a product's willingness to come home with me (or so I like to think). And there, while looking for HiP pigments I saw something that I had never noticed before. 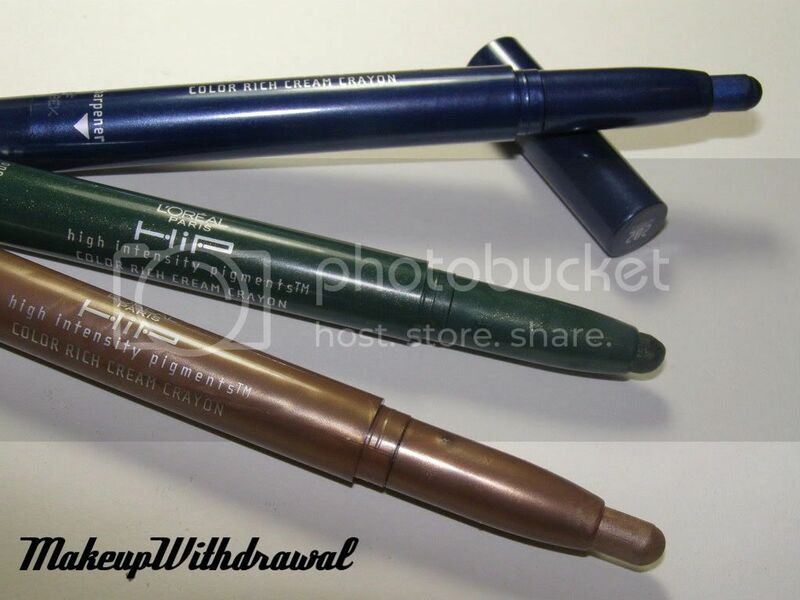 L'oreal HiP Color Rich Cream Crayons (only two in stock). These two shadow/liner crayon sticks remind me an awful lot of those MAC Shadesticks, only you know, limited color selection and cheaper. Each one of them comes with a built in sharpener on the ends so that if you wish to do so, you might sharpen them to a precise point (I probably won't because it wastes product). 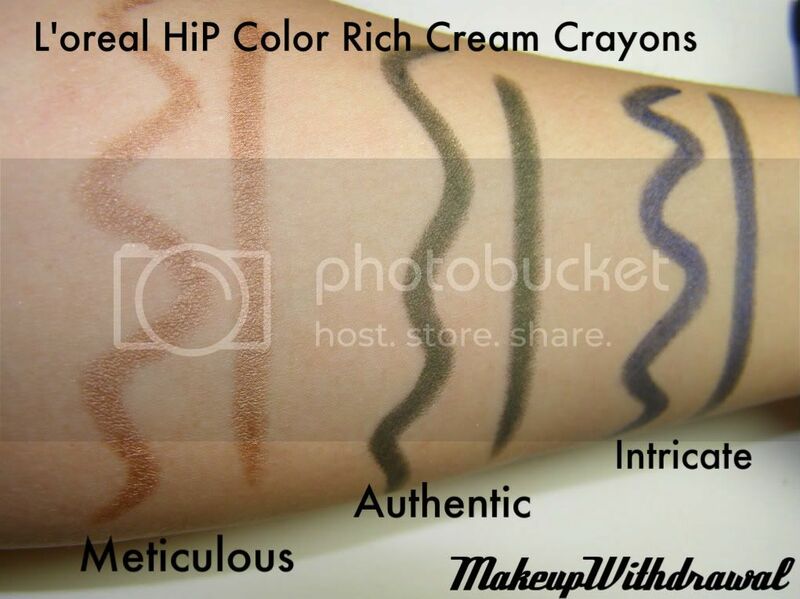 I bought Meticulous, a sort of frosty tan color and Authentic, a rich dark green with shimmer. I instantly took a great liking to the tan, because it was just such a great all over the lid color and blended effortlessly into the lid. In fact, I might go as far as to say that this particular crayon will most definitely enable me to be lazy in the mornings because it's so easy to just quickly doodle a little on the lids, blend a little brown shadow in the crease and look put together in record time. I liked the tan one so much that I immediately went another CVS hoping to see more shades. I managed to get a jeweled deep blue, called Intricate. For some reason this shade isn't as pigmented as the other two, though the color is definitely buildable. They dry quickly on my lids (though if I blink before they set, they crease), stay put all day and don't fade. I find that these sticks are best used as bases. The blue and green crayons look absolutely stunning with similarly paired shadows. Another great way to use them is to wear them under shimmery charcoal or black shadow, because it adds visual interest to an otherwise daunting shade. Wait, wait, wait- I didn't even get to the best part- They're regularly $9.99 but with the sale going on, I picked them up for $2.49 each. Great buy on my part! I can't wait to use them under the bright shadows I just got for my birthday! All products shown were purchased by me, for my own use.